Space scientist Carin Gonzales and former submarine commander Jake Sabio are two strangers drifting separately through life when a thunderous explosion above the giant Barringer Meteor Crater inexplicably brings them together, transforming both in unpredictable ways. Now able to see and smell more precisely and move in ways that are clearly impossible, Gonzales and Sabio soon realize that these kinds of life-changing alterations do not come without a price. Worse yet, they soon notice that others who witnessed the explosion are now dead from a seemingly incurable infection. The CDC wants nothing more than to lock them up in a lab for study. Special Agent Will Greenfield wants them for questioning. Contract killer Antonio Crubari would be happy if they would just hurry up and die, but he is willing to speed up the process if need be. Time is running out for Gonzales and Sabio. But even as they struggle to survive and find a cure for the deadly infection, they uncover a secret of monumental proportions that changes everything-including the future. A first generation Cuban-American, Justiz holds a doctorate degree from the University of Houston for his research in Thermo Physics and Plasma Dynamics and is a NASA Doctoral Fellow. He lives in Seabrook, Texas, with his wife, Dayna Steele, author of Rock to the Top: What I Learned about Success from the World’s Greatest Rock Stars, three sons and a faithful Labrador. 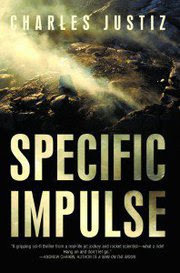 His first novel and the first in a trilogy, Specific Impulse, is available at Amazon.com and wherever books are sold. The book is a science based thriller that has been compared favorably to the works of Michael Crichton and Robin Cook. Follow @charlesjustiz on Twitter for updates and become a fan on Facebook. See his LinkedIn profile for more information on his company, JFA Corporate Aviation Safety Consulting. And please visit his website – there you will find pictures of Charles, his book, and find out about him. Roller-coaster! Yes, that would describe it. Jake, a charismatic former sub commander, is tracking clues from the tragic deaths of his ex-wife and children. Dr Carin Gonzalez, a former Airforce officer, is on sabbatical from her job as a space scientist. Their paths are unknown to each other until both are led to a meteor crater in Arizona and they become witness to a perplexing and unnatural explosion. They both start experiencing an unusual heightened awareness that enhances not only their perceptions, but also their ability to sense danger. They soon discover they were infected, as were all the others present that day in the crater and… all the others have died! Along with a machine based intelligence brought to life by Carin, F.R.E.D. (Friggin' Ridiculous Economic Disaster), they must find a cure while being hunted by a psychotic assassin. Are they looking for an answer that seems to be 'not of this world'? I love the twists and turns that keep you glued to the story. The story is far from the ridiculous science fiction they put out nowadays. It is true to the science fiction genre. I was intrigued with Charles Justiz development of the scientific element that made the character's conclusions believable. A truly enigmatic story that leaves you impatiently waiting for the next book in the series, as well as, anxious to experience 'Specific Impulse' as a movie (scheduled to begin production in 2013). OFFER: You can get the Kindle version for $3.43. Anybody that has the Kindle version, the author is generous and is willing to mail out an autographed signed copy of the book. They are having a weekly drawing.